Mark, Chrissey and Rich chat about indie Christmas lists, traditions and what we're looking forward to in the Winter break. Christmas is coming! To celebrate, join Mark, Chrissey and Rich as they chat about what they’d put on their indie Christmas lists, chat about their favourite traditions and what they’re looking forward to in the Winter break. Thanks for listening to our Christmas podcast! Tell us all about what you’re looking forward to on our Facebook page, facebook.com/TGEBreakout. 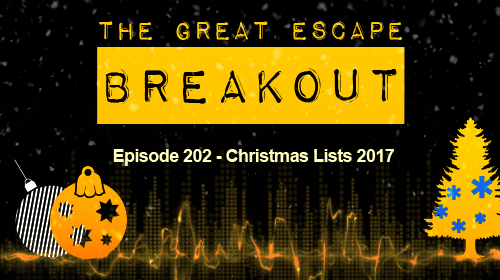 Also, check out our pages on iTunes ( https://itunes.apple.com/us/podcast/the-great-escape-breakout/id1004495683?mt=2 ) , TuneIn ( http://tunein.com/radio/The-Great-Escape-Breakout-p789702/ ) and Stitcher (http://www.stitcher.com/podcast/the-great-escape-breakout )! ← Breakout Ep. 201 – What have we done?